Hello my name is Gillian Soave and I live with my husband Benny in Dartford, Kent. Dartford’s claim to fame is that Mick Jagger and Keith Richards of the Rolling Stones were both born and bred here. We also have the Bluewater Shopping Complex is very close by. Historically Ann of Cleaves had a home here in Dartford and you can still see the ruin parts of her home around Dartford. I am a hobby breeder who is registered with both the GCCF and Tica so all my kittens are registered, mostly with the GCCF. I fell in love with the Bi/Tri colored cats so I new this was the way I wanted to go with my breeding programe. Although for the first couple of years I bred Solids as my first breeding girl was a Tortoiseshell. I now breed Bi/Tri colored kittens in Dominate and Dilute colours some will be tabby as I have a Brown Tabby & High White Boy. I have kept a lovely Solid Red boy of my own breeding to add solid coloured kittens to my breeding. I also have a lovely Blue-Cream girl from the Lafrebella cattery. My breeding lines inclued D’Eden Lover, Artemis, Ladyfairs, Candirand, Steeplechase, Tehy, El Zaburs, Atzelhof, Ladygem and Hoitytoity. I have been breeding since 2000 and I like to keep my cattery small with 2 boys and 4/5 girls so I can give them the time and attention they need. 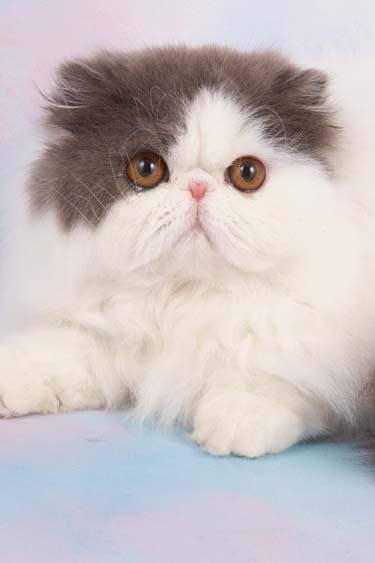 My goal is to breed Persians with a short cobby body and smooth round head with neat small ears. I like them to have large copper colored eyes and a nice open expression. Their health and temperament are most important to me and all my kittens are from PKD & PRA Neg parents. I brought my first stud boy from Margaret Parkes, he was a Cream and High White called Ladygem Creamonice. Margaret introduced me to the world of showing and we still show together. Louie did very well on the show bench making Grand Champion very quickly. I still have an other Ladygem stud boy called IGRCH Ladygem Claude Monet who again gain his title very quickly. I have also showed him under Tica and he gained his title of Tica Quad GR CH. My own bred cats are now on the show bench with a good degree of success. There can be nothing like a well groomed Persian waiting to be judged at a show. Please feel free to contact me anytime with regards to available kittens or just for advice/cat chat. Please enjoy your visit to my site.